Loose Tea Chest: Is it time to step up your game? Have you heard of a loose tea chest? A loose tea chest gives added protection and decoration to storing your loose leaf teas. While loose tea should be stored in an airtight container, a tea chest allows you to store these containers/tins in a decorative box that will add some class to your tea drinking. They also make great gifts for any loose tea lover. These tea chests can be made out of various types of wood depending on your preference. You can find chests where the wood has been polished or even ones with a glass lid. You will pay more depending on the quality of the chest. Expect to pay anywhere from $50 up to $100. These chests are not to be confused with tea chests from long ago, which were also made out of wood and used to ship tea overseas. Another benefit is that a loose tea chest can help you keep everything organized, instead of having tins spread out all over your kitchen. Usually, the inside contains a number of compartments to fit these tins. 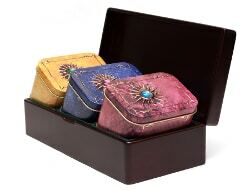 Many sellers have crafted the chests to fit their specific tins, which oftentimes come with your purchase. While a loose tea chest can give added protection to your teas, remember to always keep your tea away from light, air, and heat in order to preserve its full flavor and health benefits. If you are looking to step up your game with tea drinking, I would highly recommend these chests for a cool addition to your home. You can buy loose tea chests online at almost all of the leading tea retailers. Good luck on your search. Feel free to comment below if you have any recommendations on buying loose tea chests. Tea Infuser Mug: What is it and how does it work?